Very comfortable, spacious and well situated villa. Perfect for families, with a private pool and garden but also close to all amenities and the beach. 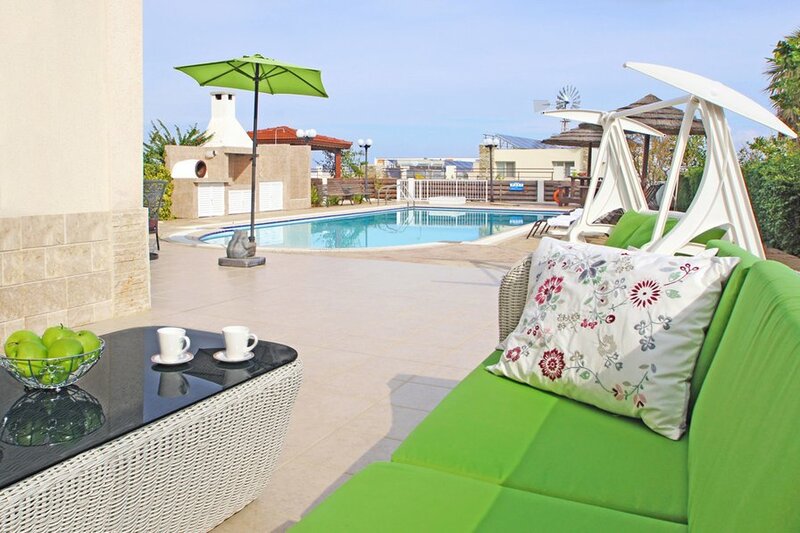 Four bedroom holiday villa with pool at Protaras, one of Cyprus famous holiday destinations with stunning beaches, good restaurants and shops. This excellent holiday villa is situated in a luxury beach side development, enjoying a unique location close to famous Fig Tree sandy beach. The villa has an open ground floor with fully equipped kitchen, dining area, lounge, and a guest's toilet. Fully air conditioned and built to the highest standards, using the best materials and luxurious furnishings. A superb Cyprus holiday villa in one of Cyprus best holiday resorts offering excellent holiday accommodation. The villa can be rented as a very specious 4 bedroom villa for 7 persons all year around. The Villa has its own private swimming pool (10m x 5m /overflow), and garden patio area with barbecue. Situated just 100 meters from the sandy Fig Tree beach. Spacious open plan lounge with TV, satellite, DVD player and dining area with a dining table that comfortably seats 6 guests. The kitchen is large and open plan with fridge/freezer, cooker, microwave, toaster, kettle, washing machine, dishwasher, ironing facilities, oven, extractor fan & all cooking utensils. There are 4 bedrooms and 3 bathrooms in the villa. One single bedroom is on the ground floor and 3 bedrooms are upstairs: 2 bedrooms are with double beds, one of them with en suite bathroom, one with 2 with single beds. The dining area is furnished with a wooden dining table that comfortably seats six guests. The landscaped yard area comes complete with an immaculate large private pool (10m x 5m /overflow) and sun loungers, a large garden table for 6, and chairs. The garden is bordered, which create a pleasant feeling of seclusion. The villa is close to excellent choice of restaurants, bars and shops within 2 minutes walk. Free swimming pool cleaning twice a week. Book this villa and be assured that this is going to be a holiday experience to remember. The villa is located in one of the most attractive resorts of Cyprus namely Protaras. A couple of minutes walk you will find bars, excellent taverns and restaurants, supermarkets, bank, kiosks and car hire rental offices. Larnaca airport is about 40 minutes drive. Ideally situated and equipped the villa offers pure relaxation and family-orientated holiday on one of the most attractive Cyprus beaches. Just beyond Protaras is Cape Greco, which is located on the furthest southeastern point of the island in the Famagusta region. This area contains a National Park Forest, occupying an area of 390 hectares and offers facilities for hiking, picnicking, cycling, horse-riding, climbing, swimming and diving. Scenery and views in this area are some of the best on the island.